Dr. Weidong Yu, The First Institute of Oceanography, Qingdao, China. Eastern Indian Ocean Upwelling Research Initiative (EIOURI) is an international research collaboration under a main purpose of better understanding of physical and biogeochemical aspects of upwelling systems in the eastern Indian Ocean (EIO) and their impacts on local oceanographic characteristics, ecological systems and economies and their vulnerabilities to climate change. EIOURI is proposed for a period of five years, beginning in December 2015. EIOURI mainly focuses on upwelling processes along the coast of Sumatra and Java, which is a largest upwelling system in the EIO, but also includes research interests in other coastal and open-ocean upwelling systems in the EIO.EIOURI covers i) physical processes, ii) biogeochemistry and ecology, iii) bio-physical relations, and iv) societal impacts of the upwelling systems, with research activities involving in situ and remote observations,analyses of existing datasets, and numerical and analytical modelling. EIOURI will also contribute to the International Indian Ocean Expedition-2 (IIOE-2), as a regional program with comprehensive approach including intensive observations and numerical modelling. EIOURI will advance our knowledge of the biophysical dynamics of upwelling systems and their response to climate variability and change and their socio-economic impacts. In addition, EIOURI will increase scientific capacity in the EIO, and enhance international collaboration in the region. 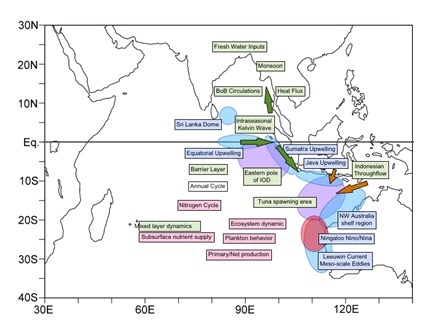 The target area of EIOURI is the eastern Indian Ocean, mainly focusing on upwelling processes along the coast of Sumatra and Java, but including other coastal and open ocean upwelling systems and surrounding areas.